For other people named George Berkeley, see George Berkeley (disambiguation). 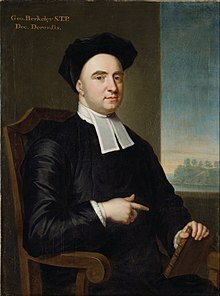 George Berkeley (/ˈbɑːrkli/; 12 March 1685 – 14 January 1753) – known as Bishop Berkeley (Bishop of Cloyne) – was an Irish philosopher whose primary achievement was the advancement of a theory he called "immaterialism" (later referred to as "subjective idealism" by others). This theory denies the existence of material substance and instead contends that familiar objects like tables and chairs are only ideas in the minds of perceivers and, as a result, cannot exist without being perceived. Berkeley is also known for his critique of abstraction, an important premise in his argument for immaterialism. Berkeley was the namesake of the city of Berkeley, California, which is most famous as the home of the University of California, Berkeley. In this book, Berkeley's views were represented by Philonous (Greek: "lover of mind"), while Hylas (Greek: "matter") embodies the Irish thinker's opponents, in particular John Locke. Berkeley argued against Isaac Newton's doctrine of absolute space, time and motion in De Motu (On Motion), published 1721. His arguments were a precursor to the views of Mach and Einstein. In 1732, he published Alciphron, a Christian apologetic against the free-thinkers, and in 1734, he published The Analyst, a critique of the foundations of calculus, which was influential in the development of mathematics. While living in London's Saville Street, he took part in efforts to create a home for the city's abandoned children. The Foundling Hospital was founded by Royal Charter in 1739, and Berkeley is listed as one of its original governors. A general practical result – which I propose to call "Berkeley's razor" – of [Berkeley's] analysis of physics allows us a priori to eliminate from physical science all essentialist explanations. If they have a mathematical and predictive content they may be admitted qua mathematical hypotheses (while their essentialist interpretation is eliminated). If not they may be ruled out altogether. This razor is sharper than Ockham's: ALL entities are ruled out except those which are perceived. Berkeley did not doubt that calculus produced real world truth; simple physics experiments could verify that Newton's method did what it claimed to do. "The cause of Fluxions cannot be defended by reason", but the results could be defended by empirical observation, Berkeley's preferred method of acquiring knowledge at any rate. Berkeley, however, found it paradoxical that "Mathematicians should deduce true Propositions from false Principles, be right in Conclusion, and yet err in the Premises." In The Analyst he endeavoured to show "how Error may bring forth Truth, though it cannot bring forth Science". Newton's science, therefore, could not on purely scientific grounds justify its conclusions, and the mechanical, deistic model of the universe could not be rationally justified. Berkeley defends this thesis with a deductive proof stemming from the laws of nature. First, he establishes that because God is perfectly good, the end to which he commands humans must also be good, and that end must not benefit just one person, but the entire human race. Because these commands—or laws—if practiced, would lead to the general fitness of humankind, it follows that they can be discovered by the right reason—for example, the law to never resist supreme power can be derived from reason because this law is "the only thing that stands between us and total disorder". Thus, these laws can be called the laws of nature, because they are derived from God—the creator of nature himself. "These laws of nature include duties never to resist the supreme power, lie under oath...or do evil so that good may come of it." Outside of America, during Berkeley's lifetime his philosophical ideas were comparatively uninfluential. But interest in his doctrine grew from the 1870s when Alexander Campbell Fraser, "the leading Berkeley scholar of the nineteenth century", published "The Works of George Berkeley." A powerful impulse to serious studies in Berkeley's philosophy was given by A. A. Luce and Thomas Edmund Jessop, "two of the twentieth century's foremost Berkeley scholars," thanks to whom Berkeley scholarship was raised to the rank of a special area of historico-philosophical science. In addition, the philosopher Colin Murray Turbayne wrote extensively on Berkeley's use of language as model for visual, physiological, natural and metaphysical relationships. "Bishop Berkeley's Gold Medals" are two awards given annually at Trinity College Dublin, "provided outstanding merit is shown", to candidates answering a special examination in Greek. The awards were founded in 1752 by Berkeley who was a Fellow in 1707–24. Turbayne C. M. A Bibliography of George Berkeley 1963–1979 in: Berkeley: Critical and Interpretive Essays. Google Books) Manchester, 1982. P. 313–329. Berkeley Bibliography (1979–2010) – A Supplement to those of Jessop and Turbayne by Silvia Parigi. ^ Watson, Richard A. (1993–94). "Berkeley Is Pronounced Barclay" (PDF). Berkeley Newsletter (13): 1–3. Retrieved 8 November 2010. ^ "Berkeley" entry in Collins English Dictionary. ^ Turbayne, C. M. (September 1959). "Berkeley's Two Concepts of Mind". Philosophy and Phenomenological Research. 20 (1): 85–92. doi:10.2307/2104957. JSTOR 2104957. C. Turbayne's reply to S.A. Grave "A Note on Berkeley's Conception of the Mind" (Philosophy and Phenomenological Research, 1962, vol. 22, No. 4, JSTOR 2105263, doi:10.2307/2105263). ^ Popper, K.R. (1 May 1953). "A note on Berkeley as precursor of Mach". The British Journal for the Philosophy of Science. IV (13): 13. doi:10.1093/bjps/IV.13.26. ^ Turbayne, Colin, ed. (1982). Berkeley: critical and interpretive essays. Minneapolis, MN: University of Minnesota Press. ISBN 978-0-8166-1065-5. Retrieved 30 May 2011. ^ "John Smibert". Encyclopædia Britannica. Retrieved 15 August 2016. ^ a b Downing, Lisa, "George Berkeley", The Stanford Encyclopedia of Philosophy (Spring 2013 Edition), Edward N. Zalta (ed.). Retrieved 21 August 2013. ^ Downing, Lisa (2013). Zalta, Edward N. (ed.). The Stanford Encyclopedia of Philosophy (Spring 2013 ed.). Metaphysics Research Lab, Stanford University. ^ Pope, in his Satires, Epistles, and Odes of Horace (Epilogue to the Satires, Dialogue ii, line 73) refers to God granting "To Berkeley every Virtue under Heaven". ^ Bettcher T.M. Berkeley: A Guide for the Perplexed. Continuum Publishing, 2008. p. 14. ^ Fogelin, Robert Berkeley and the Principles of Human Knowledge. Routledge, 2001. p. 27. ^ Fogelin, Robert Berkeley and the Principles of Human Knowledge. Routledge, 2001. pp. 74–75. ^ a b Oizerman T.I. The Main Trends in Philosophy. A Theoretical Analysis of the History of Philosophy. Moscow, 1988, p. 78. ^ Schwartz, R, 1994. Vision: Variations on some Berkeleian themes. Oxford: Blackwell, p. 54. ^ For recent studies on this topic refer to: Nader El-Bizri, 'La perception de la profondeur: Alhazen, Berkeley et Merleau-Ponty', Oriens-Occidens: Cahiers du centre d'histoire des sciences et des philosophies arabes et médiévales, Centre National de la Recherche Scientifique Vol. 5 (2004), pp. 171–184. See also: Nader El-Bizri, "A Philosophical Perspective on Alhazen's Optics", Arabic Sciences and Philosophy, Vol.15 (2005), pp. 189–218 (Cambridge University Press journal), doi:10.1017/S0957423905000172. ^ Boring E. G., 1942. Sensation and perception in the history of experimental psychology. New York: Appleton-Century-Crofts, pp. 223 and 298. ^ Ross H. E., Plug, C., 1998. "The history of size constancy and size illusions." In Walsh, V. & Kulikowski, J. (Eds) Perceptual constancy: Why things look as they do. Cambridge: Cambridge University Press, 499–528. ^ Lisa Downing (2005). "Berkeley's natural philosophy and philosophy of science". In Kenneth P. Winkler (ed.). The Cambridge Companion to Berkeley. Cambridge: Cambridge University Press. p. 230. ISBN 978-0-521-45033-1. ^ Karl Popper, Conjectures and Refutations: The Growth of Scientific Knowledge, New York: Routledge, 2002, p. 171. ^ Douglas M. Jesseph (2005). "Berkeley's philosophy of mathematics". In Kenneth P. Winkler (ed.). The Cambridge Companion to Berkeley. Cambridge: Cambridge University Press. p. 266. ISBN 978-0-521-45033-1. ^ Florian Cajori (2010). A History of the Conceptions of Limits and Fluxions in Great Britain, from Newton to Woodhouse. BiblioBazaar. ISBN 978-1-143-05698-7. ^ Cantor, Geoffrey. "Berkeley's The Analyst Revisited". Isis, Vol. 75, No. 4 (Dec. 1984), pp. 668–683. JSTOR 232412. doi:10.1086/353648. ^ a b c Häyry, Matti. "Passive Obedience and Berkeley's Moral Philosophy." Berkeley Studies 23 (2012): 3–13. ^ Berkeley, George. Passive Obedience: Or, the Christian Doctrine of Not Resisting the Supreme Power, Proved and Vindicated ... In a Discourse Deliver'd at the College-chapel. By George Berkeley, M.A. Fellow of Trinity-College, Dublin. London: Printed for H. Clements, 1712. Print. ^ "Berkeley's Theory of Morals". www.ditext.com. Retrieved 27 May 2016. ^ Berkeley, George, and Howard Robinson. Principles of Human Knowledge and Three Dialogues. Oxford, Oxford University Press, 2009. ^ a b c Buckingham, Will.“To Be Is To Be Perceived.” The Philosophy Book: Big Ideas Simply Explained, DK Publishing, New York, NY, 2011, pp. 138–141. ^ The Editors of Encyclopædia Britannica. “George Berkeley.” Encyclopædia Britannica, Encyclopædia Britannica, Inc., 6 Feb. 2012, http://www.britannica.com/biography/George-Berkeley. Accessed 15 Mar. 2017. ^ a b Urmson, J. O., et al. “The Attack on Matter.” British Empiricists, Oxford University Press, Oxford, 1992, pp. 106–124. ^ Reid T.; Ed. by William Hamilton (1852). "The Works of Thomas Reid, now fully collected". Edinburgh: Maclachlan and Stewart. Retrieved 1 December 2010 see: "Essays on the Intellectual Powers of Man" II:X , p. 287. ^ Reid T.; Ed. by William Hamilton (1852). "The Works of Thomas Reid, now fully collected". Edinburgh: Maclachlan and Stewart. Retrieved 1 December 2010 see: "Essays on the Intellectual Powers of Man" VI:VII , p. 464. ^ McCracken, Charles J. and Tipton, Ian, eds., Berkeley's Principles and Dialogues: Background Source Materials. Cambridge: Cambridge University Press, 2000, p. 5 (The editor's Introduction Archived 6 July 2011 at the Wayback Machine). ^ Reid T. "Inquiry into the Human Mind," Dedication. ^ Cited from: Steinkraus, W.E. Berkeley, epistemology, and science // Idealistic Studies. – Worchester, 1984. – vol. 14, N 3. – P. 184. McCracken, Charles J. and Tipton, Ian, eds., Berkeley's Principles and Dialogues: Background Source Materials. Cambridge: Cambridge University Press, 2000, p. 6 (Editor's Introduction Archived 6 July 2011 at the Wayback Machine). ^ Charles J. McCracken "Berkeley's Realism" // New Interpretations of Berkeley's Thought. Ed. by S. H. Daniel. N. Y.: Humanity Books, 2008, p. 24. ISBN 978-1-59102-557-3. ^ Charles J. McCracken "Berkeley's Realism" // New Interpretations of Berkeley's Thought. Ed. by S. H. Daniel. N. Y.: Humanity Books, 2008, p. 25. ISBN 978-1-59102-557-3. Turbayne C. M. A Bibliography of George Berkeley 1963–1979 // Berkeley: Critical and Interpretive Essays. (EPUP, Google Books) Ed. by C. M. Turbayne. Manchester, 1982. P. 313–329. ^ Schultz, Duane P. (2008). A History of Modern Psychology (ninth edition). Belmont, CA 94002-3098: Thomas Higher Education. ISBN 978-0-495-09799-0. ^ "Why Is Berkeley Called Berkeley?". Berkeley Historical Society. Retrieved 15 August 2016. ^ Prizes and Other Awards, Trinity College Dublin – Calendar 2016–17, p. 369. Retrieved 16 April 2017. Downing, Lisa. "George Berkeley". In Zalta, Edward N. (ed.). Stanford Encyclopedia of Philosophy. Broad, C. D. Berkeley's Denial of Material Substance – Published in: The Philosophical Review Vol. LXIII (1954). Berkeley's (1734) The Analyst – digital facsimile.